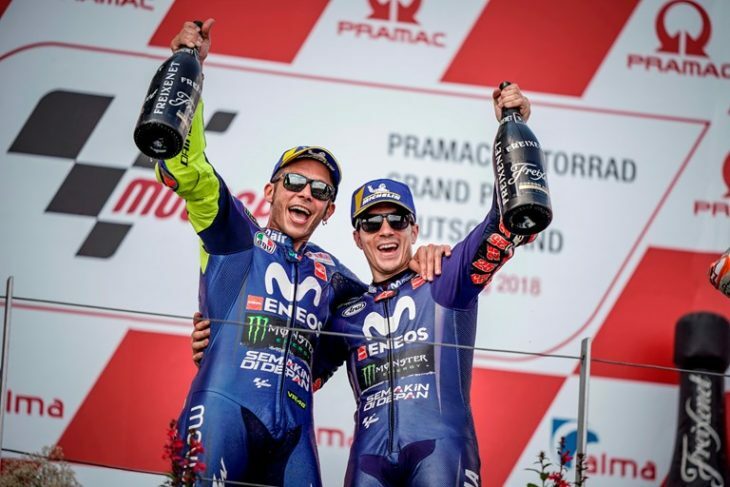 Valentino Rossi and Maverick Viñales celebrated on the Sachsenring rostrum together after a stellar performance from the two Movistar Yamaha MotoGP men. They secured second and third place respectively in this afternoon‘s Motorrad Grand Prix Deutschland, the team‘s first double podium of the season. MotoGP will be taking a short summer break after this weekend. The Movistar Yamaha MotoGP Team will be back in action in three weeks’ time at the Monster Energy Grand Prix Ceské republiky, held at the Automotodrom Brno from August 3rd – 5th. Usually Sachsenring is a difficult track for the M1, but today we were able to get a double podium, so we’re very happy, also about the work of the team. I‘m so happy because I did a fantastic race from the beginning, I never made a mistake. Last week, I rewatched the race from last year and I said to myself “Folger was good with the Yamaha, so we have to do the same!” In the end I got the same position as he did, so I‘m happy and it‘s a great way to start the holiday. It was a tough race, honestly, but I feel happy because I think we worked well throughout the whole weekend and I think we did a good job. With the team we worked hard on the last ten laps of the race, which were the most important. I think we were one of the strongest at the end of the race, but there are still things for us to improve, also on myself. It’s good to have a break right now, to give us some time to work hard and try to improve the bike. It was almost impossible to overtake today. I tried, but I was going wide everywhere. Outside, inside, I tried everything! When the tyres started to drop I was overtaking everyone in corner 8, closing my eyes, going downhill, full gas. I gave everything, and the bike was working well. I was doing some 1’21.8s or 1’21.9s and this was the race pace that I was expecting. Honestly, congratulations to the team. We’re making the steps little by little and we just have to keep working.